Among 436 new gTLDs that have become generally available, there are currently over 4 million domain names registered. According to ntldstats.com, there are now 4,050,740 registrations within new generic TLDs with the 4-millionth domain name registered on January 7. None of the domain names are up for their renewal yet, but over 4 million registrations in less than a year is an impressive number. 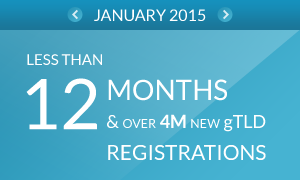 .XYZ is the most frequently registered new gTLD with over 770,000 domain name registrations. The success of the domain is largely due to the registry’s “granting” the unsuspecting registrants of the .com domains their equivalents in .XYZ. The recently launched IDN .网址 (xn—ses554g), which means “web address” in English, rapidly placed second with more than 354,000 registrations. The high volume of domain names within that gTLD is supposedly attributed to the registry’s “grandfathering its keyword customers into .网址”, including some Latin-script domains. The third most registered new gTLD is .CLUB with over 168,000 registrations. The domain registry prides itself for not “giving away” any of the registered names. Seven domain names have between 50,000 and 100,000 domain names registered: .REALTOR, .GURU, .NYC, .OVH, .LINK, .LONDON, and .PHOTOGRAPHY. Furthermore, within the top 11 domains, there are three city gTLDs – .BERLIN in fourth with 155,530, .NYC (New York City) with 67,309 in eighth and .LONDON in eleventh with 54,609 domains under management (DUM). Despite promotional campaigns of .BERLIN’s registrar and giving away or selling at a huge discount around 90,000 domains, geo TLDs are growing in popularity and should expect high renewal numbers. Overall it seems that city and regional gTLDs are thriving, similar to those representing a good idea or those backed by good marketing such as .CLUB, .GURU, .PHOTOGRAPHY and .EMAIL. The next few months, however, will be the real testing ground, when the time for domain renewal comes up.